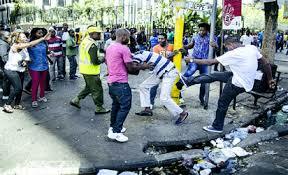 Brothers and Sisters’: Unchecked Xenophobia in South Africa – Royal Times of Nigeria. Many will recall reports made three years ago about incidents of xenophobia against Nigerian citizens living in South Africa. Unsurprisingly, the immediate and diplomatic response was to condemn any such acts, overtly denouncing xenophobia. Rhetoric is nice and rhetoric is pretty, but it is not good enough. Worse still is claiming that xenophobia does not exist when it clearly continues to this day. As recently as Sunday, the 22nd of April, a Nigerian man named Clement Nwaogu was burnt alive by a mob in Rustenburg. In light of this, there is a clear difference between vision and reality in South Africa. Xenophobic actions are not limited to mob violence. Currently, 14 Nigerians who protested the killing of a fellow citizen in South Africa’s North West province are still in detention. Police and lawyers involved claim that detaining the peaceful protesters is the best step towards avoiding future violence. There is clearly a disturbing lack of justice surrounding the issue. Possibly most disheartening of all is the Nigerian government’s response to these disturbing developments, or lack thereof. The government, like any, should be outraged at the irrational and extrajudicial killing of its citizens. Instead, the government has taken on a similarly passive stance in responding to the issue. The Nigerian government described the death of Clement Nwaogu as unfortunate and called on the South African authorities to find a lasting solution to the killing of Nigerians. In fact, it can be stated that aside from these fleeting remarks, the federal government has swept the whole issue under the rug. We can no longer fold our hands while our people are slaughtered by our people on our very own continent. This is an appeal to the Nigerian government: Place economic pressure on South Africa to bring and enforce justice. May God bless our dear country, Nigeria. This commentary is dedicated to the fallen Clement Nwaogu, as well as all other Nigerians who have lost their lives to hate crimes in South Africa.